Using cabernet sauvignon as the base for this barbecue adds a lot of extra complexity, whether that's good or bad when put up against the standard because sauce players is open for debate. This sauce was provided to me all the way at the beginning of the summer, before it even went on sale. Because of my relocation and everything involved with it, I shamefully just got around to trying it out a couple weeks ago even though it's a limited-time deal only available until September 30. 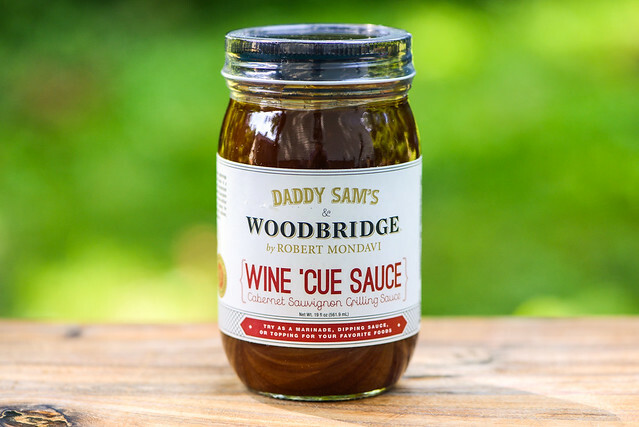 The sauce is a collaboration between Woodbridge Winery—a winery started by Robert Mondavi in Acampo, CA.— and sauce purveyor Daddy Sam's out of West Texas. 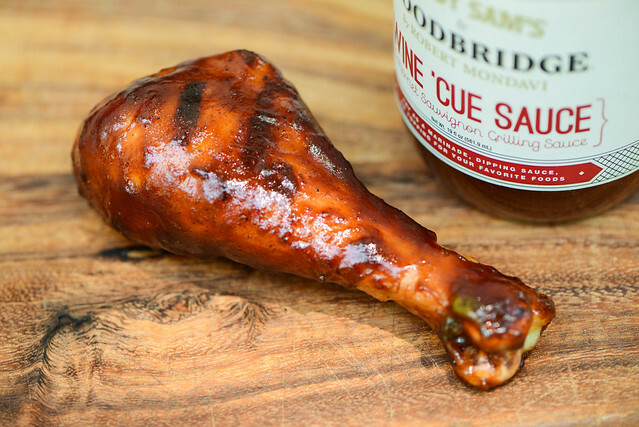 The idea behind it was to take a Woodbridge Cabernet Sauvignon and use it to build a barbecue sauce with a twist, taking advantage of the fruity complexity of the wine to create a unique sauce that could top just about any meat or vegetable you desire. Any hint of wine is drowned out by the heavy dose of molasses and vinegar that are the two upfront players in the aroma department. Taking time to smell more deeply beyond the tangy sweetness, there is a distinct fruitiness that includes the standard tomato, but has a deeper complexity than the average sauce—without knowing it was wine, I may not have been able to clearly point out that was the source. Behind the fruity layer there's notes of garlic, onion, Worcestershire, and the most mild touch of pepper, although there's no real heat in the aroma. 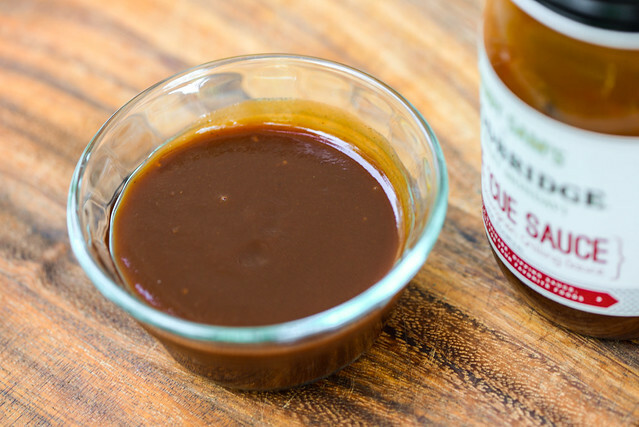 This incredibly smooth sauce floats just below the medium thick line. It has a consistency that lets it fall quickly in a steady stream off of a spoon, but after a few final drips release from the silverware, there's still a sizable, semi-opaque layer of sauce left clinging. In terms of spices, there are definitely specs of both white and black lightly sprinkled throughout. Though not heavy in the aroma, the wine adds a lot of complexity upfront in flavor. You get the strong fruitiness and acidity of wine on first taste, which also mixes with a light tomato and mellow sweetness. 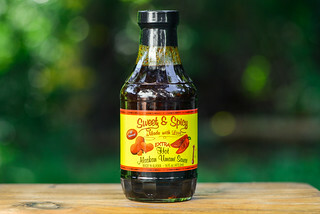 As the sauce settles on the tongue, all those initial flavors remain, but molasses and Worcestershire come in as additional layers of flavor, although they taste a little off in contrast to the wine. Then the sauce begins to get a little bitter and a lot more tangy as the spices work their way in. First it's the garlic and onion I was able to point out in the aroma, then it's a nice touch of heat that brings another level of fruitiness by way of jalapeño. Once the sauce has left the tongue, the final aftertaste is primarily tangy heat. This sauce coated the chicken in a thin, even layer that baked down well, allowing it to build up nicely over multiple brushings. Once introduced to direct heat, there was only mild caramelization that left attractive grill marks on the chicken leg. The wine flavor that was more integrated out of the jar became very prominent after being cooked. The balance it found with tomato in its raw state was lost, although it retained a couple its the other barbecue sauce aspects—mainly tang and sweetness, while the heat and nuances of other spices were mostly loss. I'm all for experimenting with barbecue sauces, heck, I've made some great ones with things like balsamic vinegar and peaches. This had me excited to see how wine faired as a base, but I was left not all that impressed. 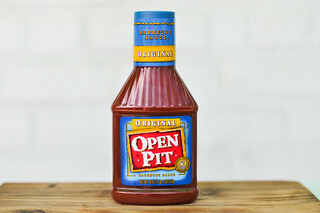 I thought the complexity the wine would bring would be a no-brainer to add great depth to the standard barbecue flavors, but I found in this sauce, with this amount of wine, there was a contrast between things like Worcestershire and molasses that didn't play that well with the cabernet. Still, on first taste I thought it was pretty decent sauce, but when the flavor of the wine was brought out even more after being cooked, it just wasn't working for my personal preferences anymore. 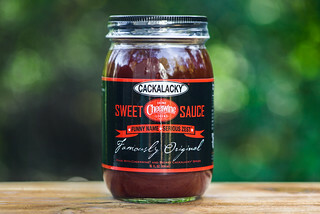 It's still a well put together sauce with very nice progressions of flavor, and based on other reviews, it has found a warm spot in the hearts of some. So take my assessment with a grain of salt and if this sauce sounds interesting to you, don't wait and get your bottle now, because it may only been available for a couple more weeks.